I ran to MOMA this week, last minute, to see the long overdue de Kooning a Retrospective, which closes on Monday. One of the earliest painter-heroes of mine, I couldn’t miss it. And it was wonderful. As I entered the final room of the MOMA exhibition, I stood before the wall with three of the late paintings, circa early 1980’s, looking for the painting I stood before in 1982 when I met Mr. de Kooning at his home in Springs, Long Island. What I noticed was a dominant warm yellow color in them. I looked around, and many of the late paintings seemed to be concerned with this particular yellow in or next to expanses of white. Then suddenly I remembered a humorous detail of that magical evening when I met Mr. de Kooning that now, in front of his late paintings, appeared to be strikingly significant. I had the good fortune and honor of meeting Willem de Kooning in the early 80’s. I was fresh out of graduate school, still then a performance artist, but only a few years from deciding on painting as my right medium. We met at his place on Long Island for dinner. Swordfish. Cooked by his wife Elaine, who had returned to care for him after he had finally stopped drinking and was ‘going down hill,’ or so they said. He was still painting at the time, and there was a mess of painting and drawing going on in that famous studio of his. I arrived with Robert Wilson, late of course—to my horror, not to Robert’s. We had actually missed dinner, and Elaine had to cook what she had saved for us on their massive restaurant stove. There was one other person there, some major New York socialite whose name I forget. (She’d be mortified.) It was her that set up the dinner for Bob Wilson’s sake. I remember Bob telling me once that his three greatest inspirations were Willem DeKooning, Barnett Newman, and Ballanchine. Joe Cocker was up there too. Later I asked him if I could have the privilege of entering his studio. He gladly let me in to roam alone the piles and splatter. Scribbles and sketches everywhere, that I touched, handled, even stepped on. Oddly, what impressed me most—I was not then so fond of his later paintings—was how he worked, and the layout of the place: the ship’s prow of a viewing balcony jutting into the studio high above, and the worn spots on the protected paper-covered floor where he stood most often, always in relation to the painting being worked on. The spot close to and just to the right of center of the large canvas on his famous tractable easel that could drop the painting below floor level in order to paint the top; the spot left of that where he mixed paint on his enormous work table with its own topography and architecture evoking painted histories; the spot yards in front of the canvas where he stood at a distance, between passages of painting, to see where he or the painting was heading; and the worn spot further back still, for relaxed contemplation, at the foot of his heavy Dutch rocking chair with wide paint-stained arms. And the paint-stained coffee mug resting on the small table separating his chair from the other like-chair to the right, cleaner and with no worn spot at its foot—the guest’s chair, the dealer’s chair, Elaine’s chair. I sat in his, touched its arms of still-wet paint, looked at what he saw, then walked the runway between his chair and his painting, awestruck, standing in all his spots. 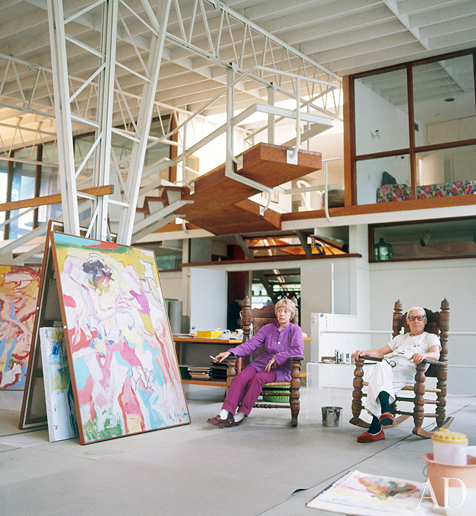 For more Architectural Digest photos of WdK’s Springs home and studio, click HERE.